This event will feature a discussion of Rucker C. Johnson’s new book Children of the Dream. Professor Johnson will appear in conversation with Dean Prudence Carter and Berkeley Law’s Chris Edley, Jr. While we are frequently told that school integration was a social experiment doomed from the start, Johnson demonstrates in his new book that it was, in fact, a spectacular achievement. Drawing on longitudinal studies going back to the 1960s, he shows that students who attended integrated and well-funded schools were more successful in life than those who did not—and this held true for children of all races. Yet as a society we have given up on integration—since integration’s high point in 1988, we have regressed and segregation now prevails again. Contending that integrated, well-funded schools are the primary engine of social mobility, Children of the Dream offers a radical new take on social policy. 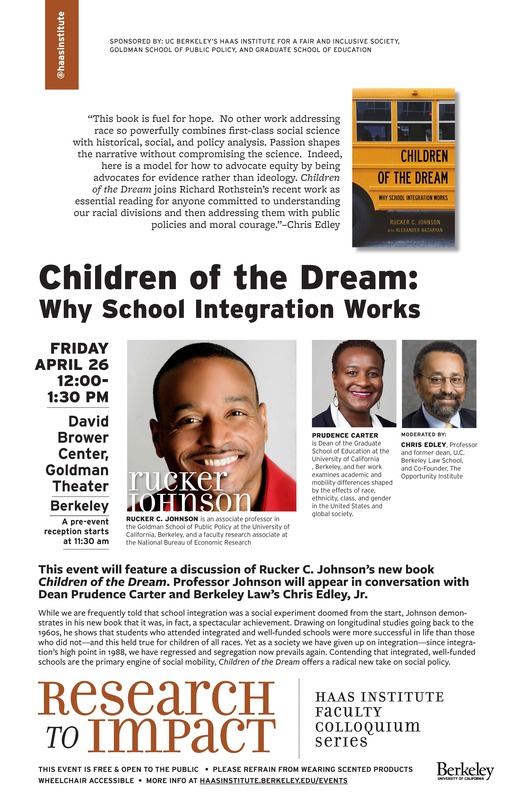 What: Rucker Johnson will present findings from his new book “Children of the Dream: Why School Integration Works” followed by an insightful dialogue with Chris Edley, Distinguished Professor of Law, UC Berkeley and Prudence Carter, Dean Graduate School of Education.